If you have Windows Server licences with Software Assurance then you have the Azure Hybrid Use Benefit. This means that you can choose to use your licences to license the Windows Server part of an Azure virtual machine and so just pay for the compute cost of the VM. If you have an EA you can deploy VMs from specific Marketplace images that are pre-configured with the Azure Hybrid Use Benefit. Without an EA you can upload a custom VM and deploy using a Resource Manager template or Azure PowerShell. This article explains all and has some useful illustrations http://bit.ly/2lbjIbe. Microsoft announce the availability of Forms for Office 365 Education customers, allowing users to create quizzes for assessments or surveys. From a licensing perspective, it’s included in the Office 365 Education and Office 365 Education E5 plans, and you can find full details here: http://bit.ly/29q9wte. 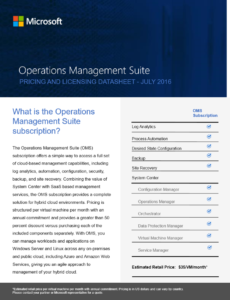 There’s a new (July 2016) Operations Management Suite Pricing and Licensing Datasheet which has full details about the new OMS Subscription. Previously, OMS was only available as an Add-on to existing System Center licences with SA, but the OMS Subscription gives you access to all the Azure services of OMS as well as all of the System Center components for use with 1 virtual machine. Find the Datasheet in the Core Infrastructure section of our Licensing Guides store: http://bit.ly/MSLicensingGuides. There’s a new (May 2016) Enrolment for Education Solutions Volume Licensing Guide. However, don’t be misled by the title – it’s not just the EES signed under CASA that’s covered, but also the Open Value Subscription – Education Solutions (OVS-ES) agreement. It’s a comprehensive 27 pages of education licensing loveliness and has useful sections (among others) on Platform Online Services, the Student Use Benefit, the Server Platform option, and the Student option. Find this guide in the Volume Licensing Programs section of our Licensing Guides store: http://bit.ly/MSLicensingGuides.